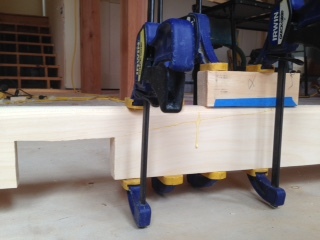 I’ve been hoping to augment the blog with some of my recent home building work. The truth is, building houses is by-and-large boring, methodical work. Details are important, and careful work counts for a lot in contemporary construction. But two weeks of cathedral ceiling insulation? Boring. Day to-day my primary vocation is homebuilder. In the small company that I work for we do everything aside from concrete, plumbing, and electrical. The control afforded by doing all the finish trades ourselves allows us to take the time required to focus on the energy efficiency details that are so important to contemporary construction best practice. Among the details that we’ve been focusing on, air-sealing the building envelope holds our focus most consistently. In a heating climate any uncontrolled air movement from the conditioned/heated interior space into the wall cavities can cause significant moisture problems. We’ve been following air-tight sheet rock protocols on our last jobs, which in itself is fairly straightforward. The most significant problem we were encountering was air-sealing the electrical penetrations. 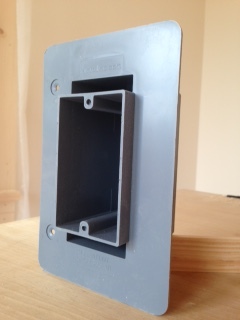 On our current job we’ve been solving the electrical penetrations issue with boxes made by Airfoil Incorporated. The boxes are robust plastic construction with a substantial ring for sealing the box to the sheet rock as well as foam reservoirs at the wire penetrations. 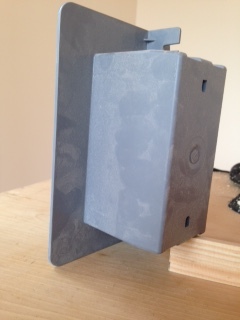 Boxes are mounted to the stud face with drywall screws for a strong connection; the sealing ring is the mounting mechanism, assuring consistent depth. Airfoil single gang box, front view. The foam voids are visible here. Once rough wiring is completed the upper and lower voids are filled with foam, sealing the wire penetrations. This effectively keeps the box on the conditioned side of the building envelope and prevents any air/moisture movement into the wall cavity. While hanging sheet rock the flat sealing ring is caulked along with the window/door openings and the top and bottom plates, completing the air sealing process. A simply designed, robustly built product that installs easily, integrates effortlessly into traditional stick-frame construction, and makes completing the tedious-but-essential air-sealing details quite a bit quicker and more efficient. Excellent. I’ll use this product on my own jobs in the future. This entry was posted in Homebuilding and tagged air sealing, best-practices on October 19, 2014 by Isaac Guenther.